Like much of life, a day of climbing is best kick started by a heavy dose of caffeine. 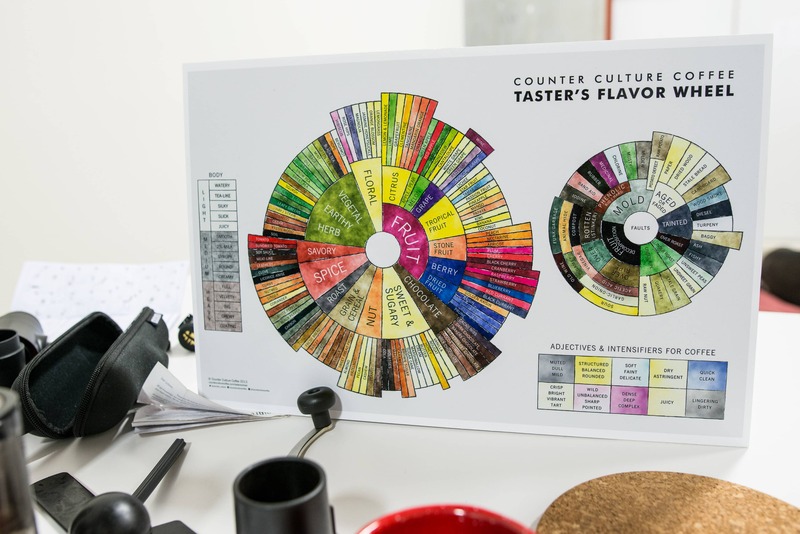 The performance and mood enhancing effects of caffeine greatly increase success rates by supplying the necessary motivation for the climber to get up and then, once imbibed, lubricate synapses whereby headaches are avoided and speech becomes possible. After a few more cups, there is a buildup of energy that can be evidenced by a shaky, giddy feeling and you know it’s time to unleash on a climb. So the question becomes, what’s the best equipment for preparing the sweet nectar in the back country? Given the grave importance of this topic I realized that my readership was owed a comprehensive and unbiased review of camp coffee preparation equipment. So, I’ve put some of the best coffee makers in the back country business to the test to see where and when they should be used or avoided. I’ve chosen a wide range of coffee preparation equipment, not just the lightest or most compact. If light was what we were searching for then Alpine Start instant coffee would be the winner, it’s not the best coffee but it sure is packable when weight and size matter most. However, the reason I wanted to look at a wide range of options is because different equipment may excel on different trips be it car camping, fly-in base camp style camping, hut based tips, hike-in tent based, etc. 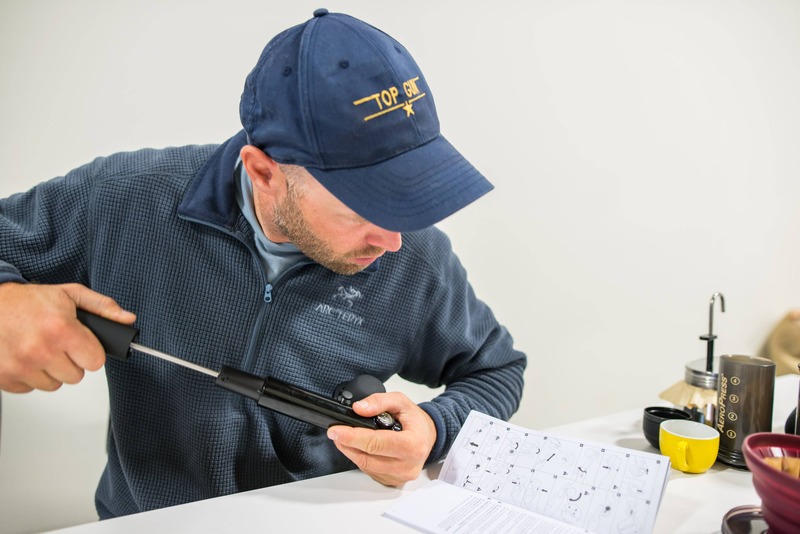 The next decision was the testing environment, do I test this equipment in the outdoors on a trip or in a controlled environment for a true comparison? This was a tough decision so I opted for both. The taste testing was done in a controlled environment but the equipment was also put through the paces in the the real world where water can be limited and dirt always an issue. The wizard Tim ensuring that that water is the right temperature. For the controlled environment I solicited the help of Squamish’s local coffee roaster Counterpart Coffee. Who better to help me test out some coffee makers than someone that makes his living roasting beans and tasting coffee? And I have to tell you I was not disappointed! 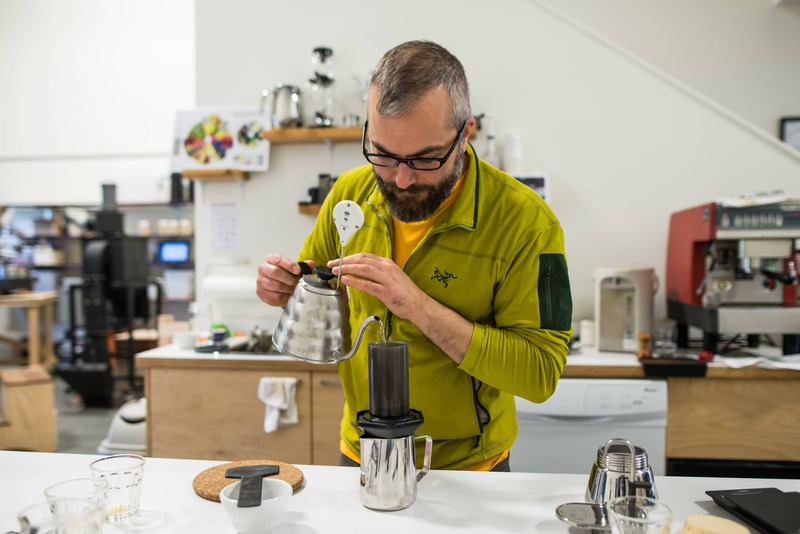 Tim, who owns and operates Counterpart Coffee with his wife Emily, is a fantastic blend of mad scientist and coffee wizard. This guy is absolutely meticulous in how he approaches everything to do with coffee. 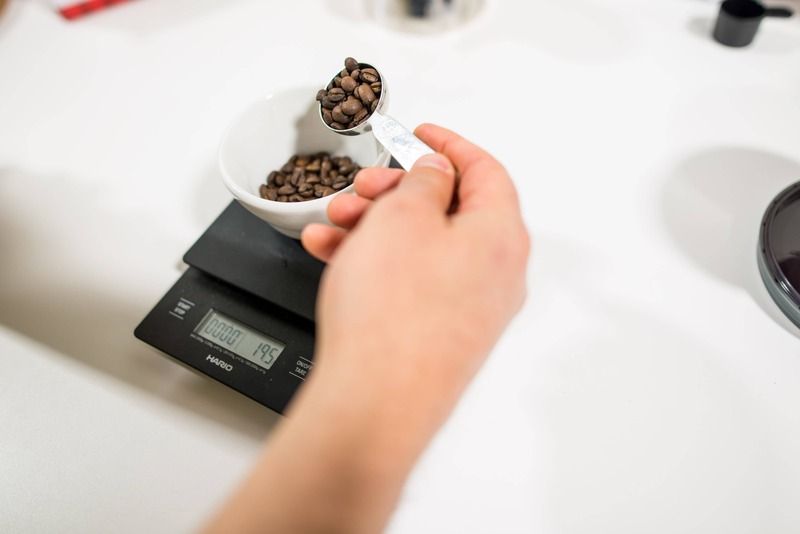 We ensured that the water was at the right temperature as he had a thermometer in the kettle, beans were always measured out on a scale, water to coffee ground ratio’s strictly adhered to and so on. The operation was simply impressive! Ensuring the right ratio of beans to water. Tim: as I mentioned above Tim is our main tester and of course the most knowledgeable. Me (Monte): as a long time addict I’ve brewed my fair share of the black nectar. Raf (The Alpine Start): surprisingly Raf was not a coffee drinker but this experiment brought him and his scotch honed taste buds on-board. Now onto the results of all this testing. 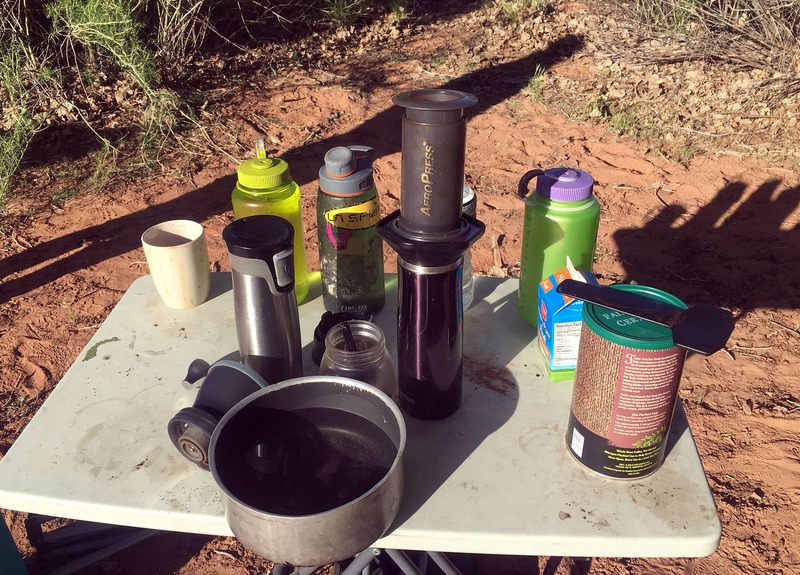 The first camp coffee maker we tested was the Collapsible Java Drip by GSI Outdoors. This is basically a standard drip coffee maker that you place over a cup or pot and pour hot water through. It’s made of silicone which is preferable for this application than other plastics though not quite as good as stainless steel. However, because it’s made of silicone it’s collapsible (as I’m assuming you figured out from the name), light (131g) and comes with a lid that’s useful for storing but also for keeping in the heat while brewing and provides a place to put the java drip after brewing that won’t make a mess. When it comes to field use one of the really nice things about this coffee maker is how easy it is to clean up. Just pull out the grounds and filter and done, a great option for camping where water is limited. The GSI Outdoors Java Drip collapsed with the lid on. So how was the coffee? Well great actually! I’m sure that Tim’s expertise really helped, as did the freshly ground medium roast Brazilian coffee but it just goes to show that this unit can make a really good cup of coffee if you do it right. Ready for the first taste test. Overall: This is a great unit for backpacking weighing in at a measly 131g and is the size of a small lid for a pot. Clean-up after brewing is quick and easy as the filter with grounds is removed and the lid clips on. This was the best unit tested for backcountry camping where size and weight are important or where water is scarce. This much hyped coffee machine is basically a press that has been redesigned to not have a bottom. That being said it’s a slick unit and our overall favourite for everyday use. 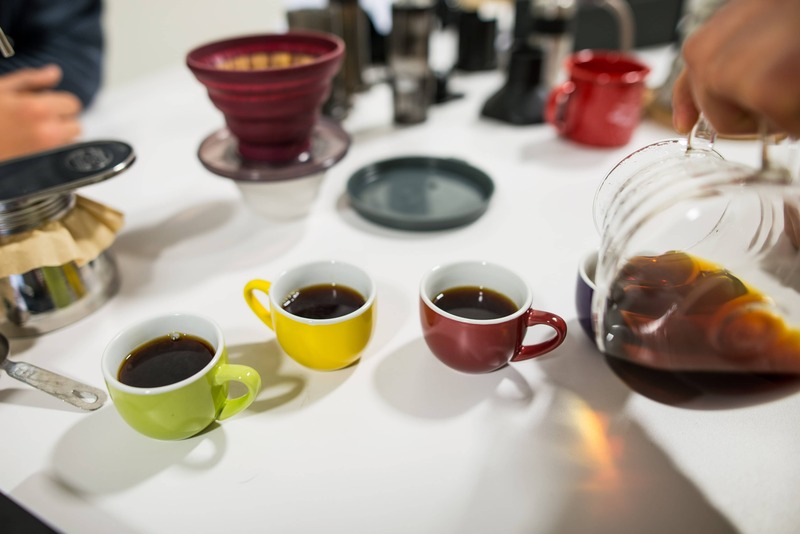 We moved on to a nature process Ethiopian coffee for testing the AeroPress and before you ask, yes we did try both the inverted and regular brewing methods. 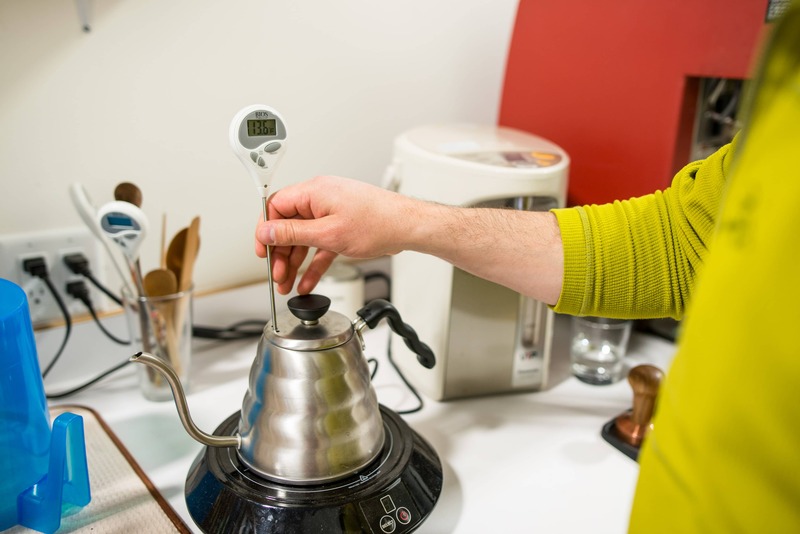 For those of you not in the know there’s a plethora of information on this popular coffee maker online but we have included the coles notes version of how we went about brewing coffee with this unit. 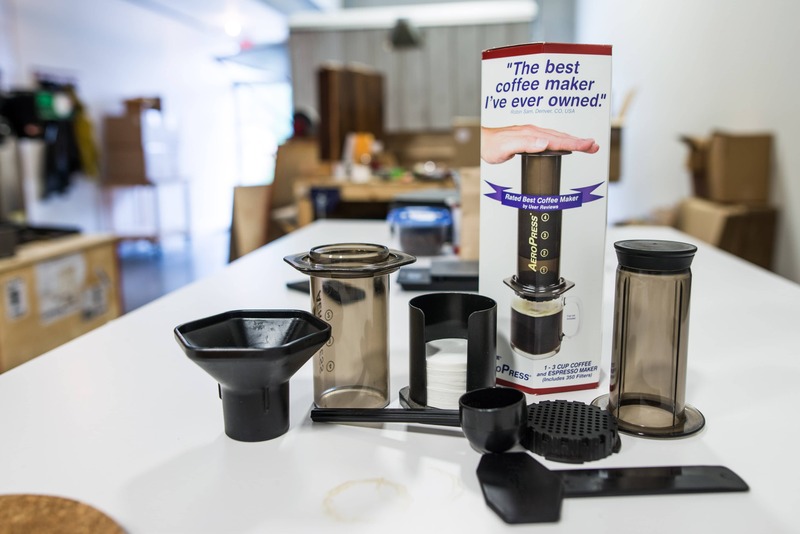 The Aeropress with all it’s pieces and parts. 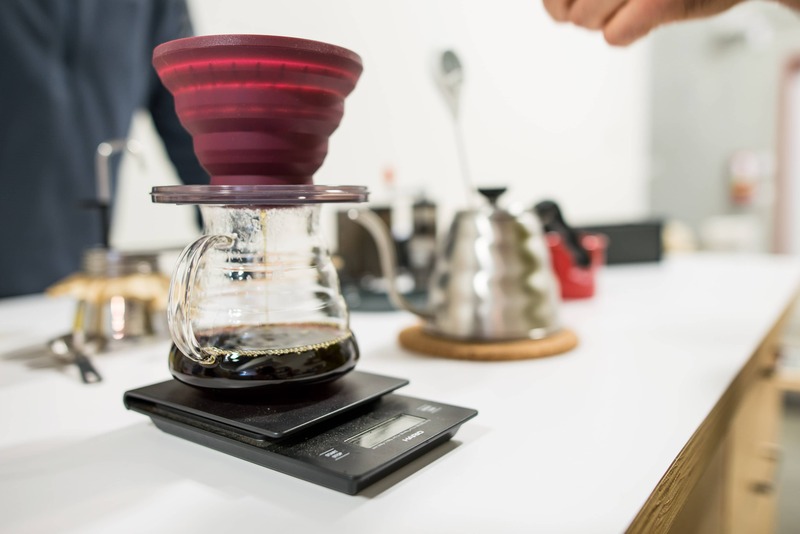 For the inverted method of brewing the machine is turned upside down and, with the plunger in place, coffee and hot water are added and stirred. Then the screen with filter is screwed on and after about 75 seconds the entire unit is flipped over onto a cup or pot and the plunger depressed in a slow and steady manner. Tim noted that it helps to have a transparent cup when learning how to depress the plunger properly. Anyway, that’s the process for the inverted method. 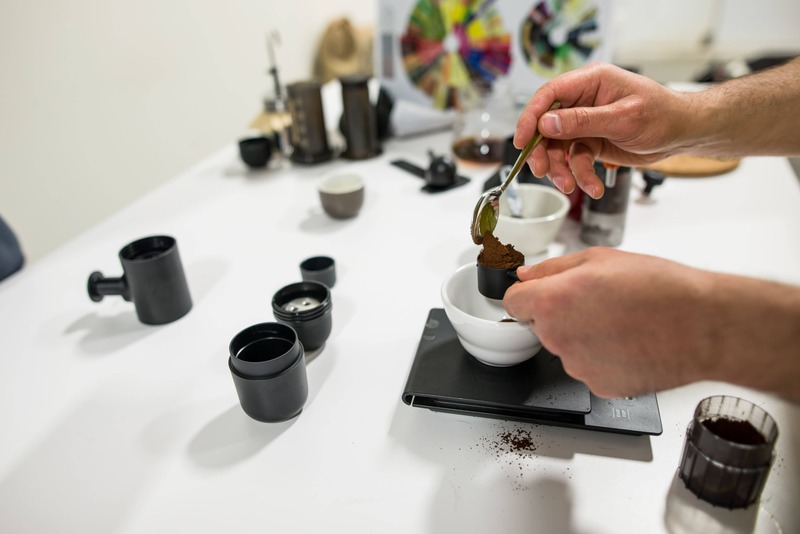 For the regular method the coffee and water are poured into the unit as it sits on a cup or pot and then stirred. The plunger is put into place and depressed until a seal is made and then pulled up slightly to stop more coffee from dripping into the cup. After about 75 seconds the plunger depressed in a slow and steady manner. So what did we think? Well the Aeropress is a bit more work to clean than the Java Drip as the plunger and brew chamber need to be washed or wiped. It takes significantly less work to clean than a traditional press though. Some versions of the Aeropress seem to come with a bag while others do not, the bag is nice as this thing has a lot of parts and pieces. Field testing photo from Indian Creek where water is always in limited supply. What about the coffee? Well the Aeropress makes lives up to the hype! We added some hot water americano style to the brew from the press and found that the machine created a very smooth and rich cup of coffee. This was a favorite of the testers. The product, ready for testing. 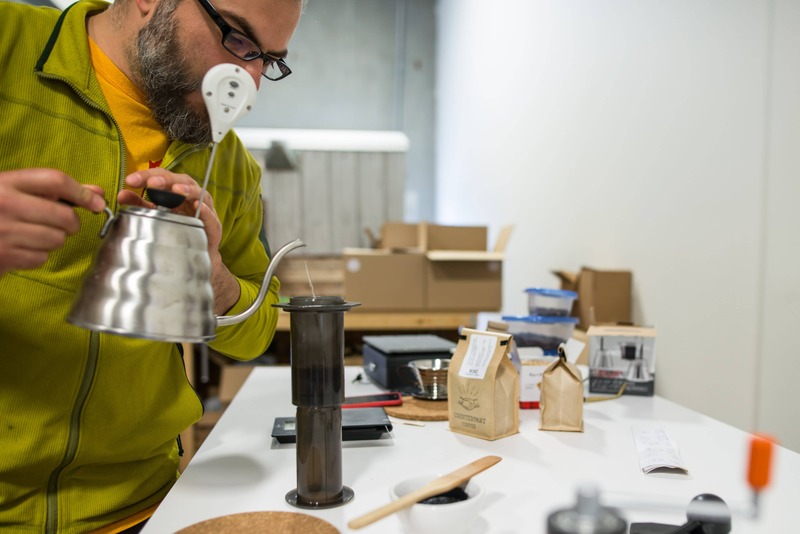 Overall: This was the best all-round coffee maker that we tested, if you’re hitting the road and need an everyday brewer that produces a really good cup of coffee look no further. A little bulky for back packing though and it takes a bit more to clean-up than the Java Drip. This particular brewer exudes class. It comes in a black fabric covered box with foam cut-outs that cradle the equipment like a fine single malt. The espresso machine itself is sleek and glossy black with a very distinctive phallic shape. This unit is different from the above coffee makers in that it brews a shot of espresso, not a cup of coffee. Of course hot water can be added Americano style to make a cup of coffee. So how does it work? Well it’s a somewhat complicated 16 step process but to summarize, you put hot water and grounds into the unit, pump the handle (yes you actually pump the phallic shaped device!) which is basically a bicycle pump until the correct pressure has been reached (about 16 bars) and then position the nozzle over a cup and release the lock. This forces the hot water through the grounds under pressure and wa-lah espresso! Studying up how to use the handpresso, there is bit of a ritual involved. Needless to say but using this machine involves a ritual (a 16 step ritual) that takes time to go through. This will call to a certain type of person, someone that enjoys the process of making a good cup of coffee or shot of espresso as much as drinking it. The unit itself is quite heavy (0.5 kg) and needs to be rinsed after each use and so is not really for backpacking. However, if you want to make a good cup of espresso at that fly-in lodge or car camping trip this is a great unit. The quality of the shot of espresso likely has a lot to do with how practiced the operator is and so it would be a good idea to practice at home before showing off to your friends at the ski lodge. That being said, our first few brews out of the unit were quite good. The espresso that we produced was smooth and creamy with a slight bitter edge and while there was no crema we could see the oils in the shot. It’s likely that we just need a bit more practice with this unit to perfect the process. The finished product. No crema but lots of oils in a smooth and creamy shot with a bit of a bitter edge. Overall: This machine will call to a certain type of coffee fanatic, someone who enjoys the process as much as the product. Because of its heavy weight it may not be ideal for backpacking however for car camping or a fly-in lodge this is the ticket. The Minipresso GR is also an espresso machine, brewing a shot of espresso and not a cup of coffee. The GR version of the unit uses coffee grounds, other models (CA & NS) use disposable cartridges and were not reviewed. 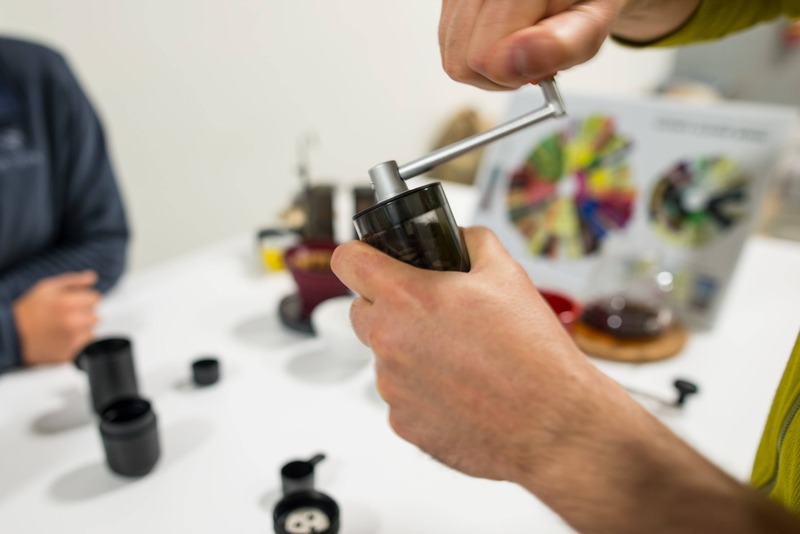 The compact cylindrical device is matte black and somewhat less phallic shaped than the Handpresso, though the basic principles behind it are the same. 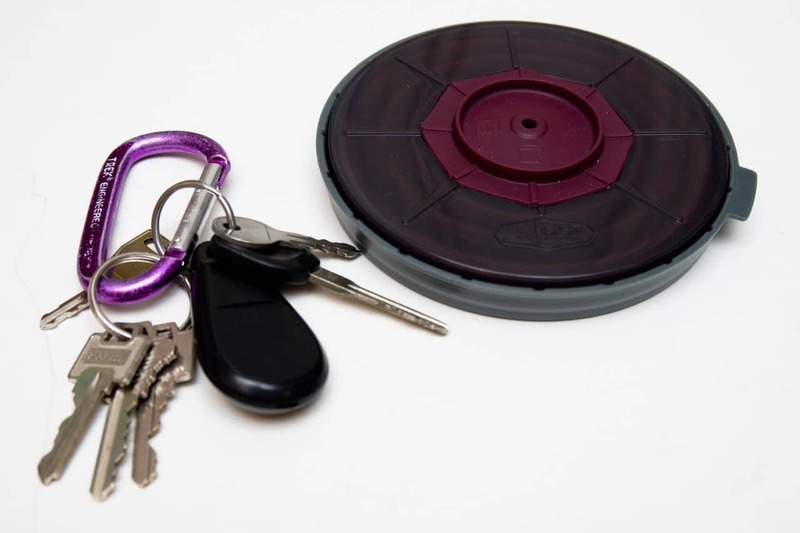 There’s an optional protective case available for the unit making it easy to pack. So, how does this machine work? Well it also has a complex (14 step) process for brewing, one that took us several tries to get to a point where the espresso produced was palatable. Basically hot water is put in one end of the machine and coffee grounds are put in a container on the other. Then, while holding the end over the included cup, the pump is depressed continuously until no more espresso comes out. Loading the scoop in preparation for making a shot with the Minipresso, all the parts of the machine are laid out ready to go. 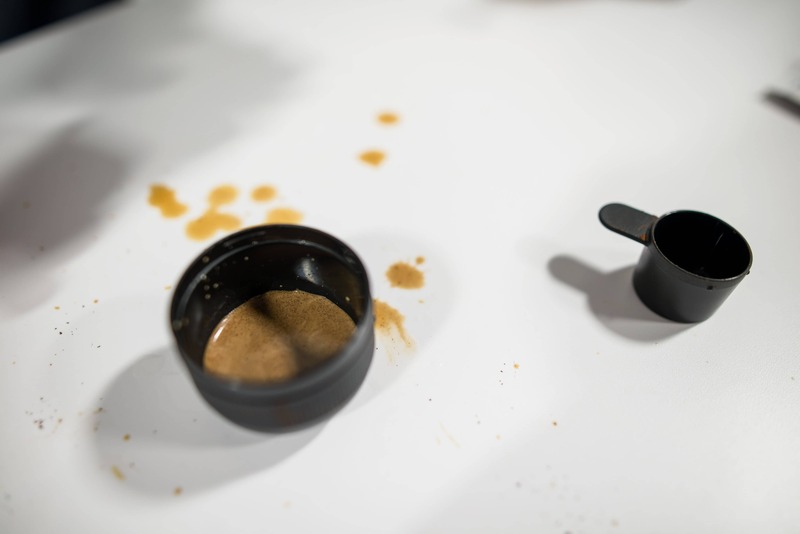 One important thing we learned was that if the grounds were not tamped the Minipresso does not seem to operate properly and the resultant espresso is watery and laden with a fine sediment. The instructions did say to tamp but the suggestion was hidden in the fine print at the end. It’s important to practice with this machine a few times to get the hang of how to use it properly before taking it with you on a trip. An early failed attempt to make a shot of espresso, we still needed to finesse our process a bit at this point. 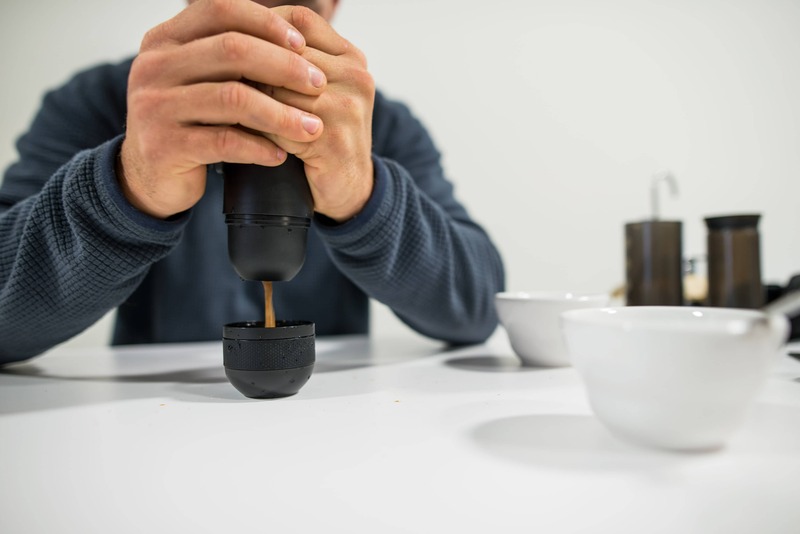 The Minipresso is the lighter (30%) and more compact of the two espresso machines and comes with a cup for the shot and a scoop to help load the coffee container. 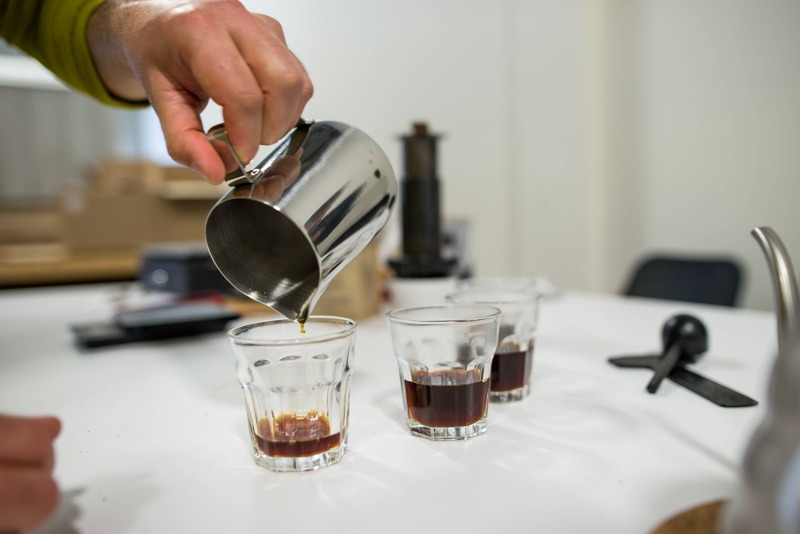 However, once the shot has been prepared it makes a mess when it’s taken apart to reload or to clean as excess water and coffee spill out. The coffee ground container itself is easy to clean though as it just needs a quick rinse. Brewing a shot, my right hand is depressing the pump. The quality of the espresso produced has a lot to do with the operator. Our first few shots were terrible but they improved dramatically with practice and some finessing of the preparation procedure. In the end the espresso made was smooth and topped with a prefect crema. Overall: Because it is a little lighter and more compact this unit is great for people that want to take espresso on a trip where weight and size are not critical but still a consideration. 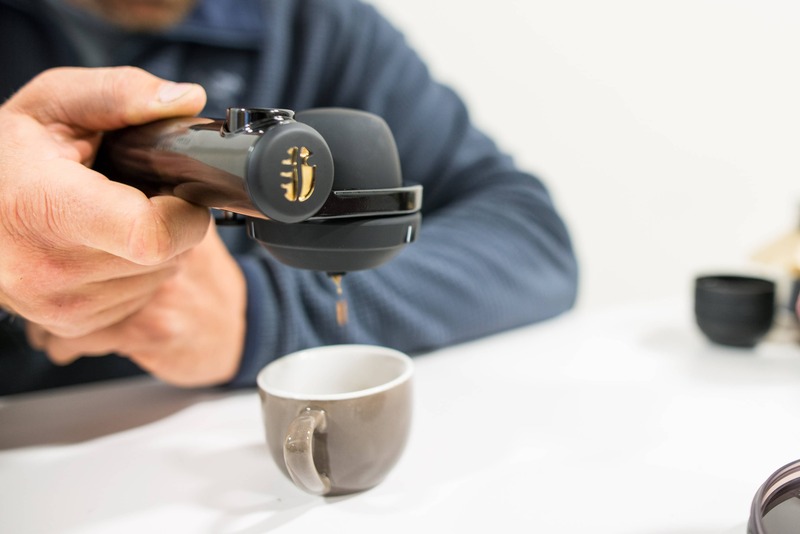 Last, but not least, we tested out GSI Outdoors’ 4-Cup Stainless Mini Expresso. This coffee machine is basically a moka pot without the top chamber, instead it has a flat shelf where a cup is placed for the coffee to be brewed directly into. While GSI Outdoors makes three models of this particular machine: a lighter aluminum 1-Cup model, a stainless steel 1-cup model and of course the 4-cup version that we tested. 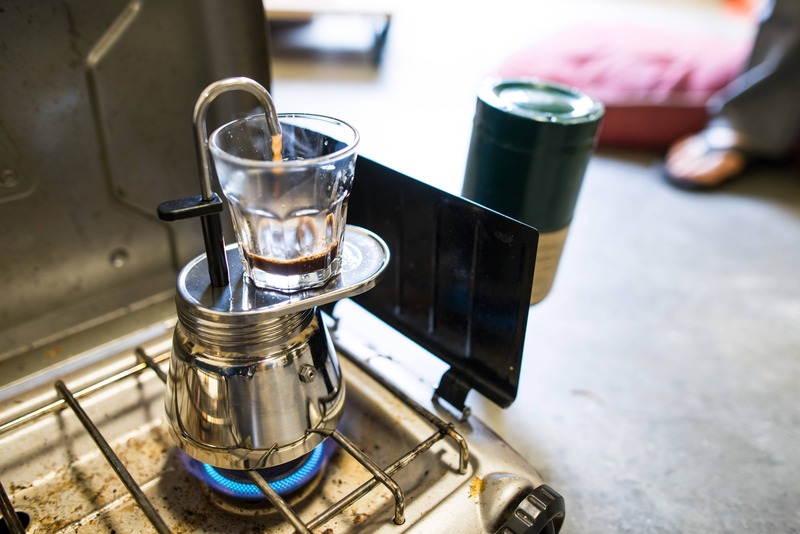 We opted for the 4-cup model thinking that it would allow us to brew coffee for a small group all in one go while out on a car camping or fly-in base camp/hut type trip. The first thing of note with this machine is that it doesn’t make a shot of espresso but rather an enriched cup of coffee. 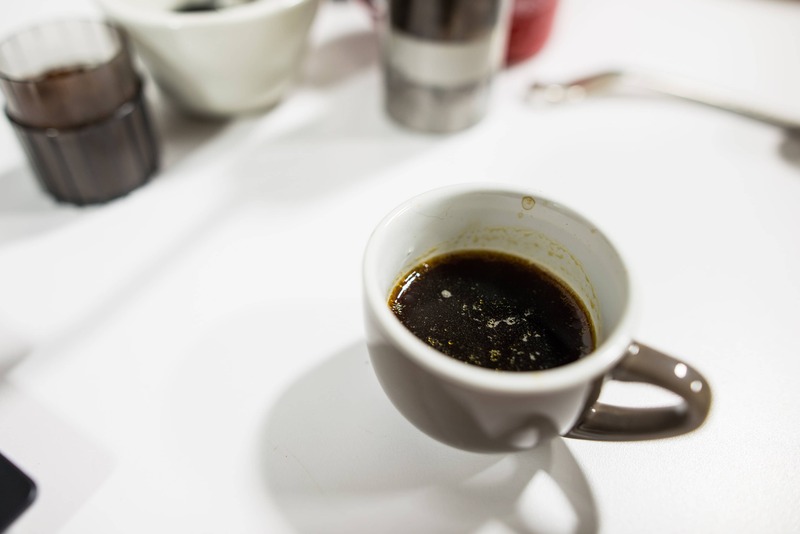 A proper cup of coffee is then achieved by adding hot water Americano style. The coffee brewed by the Mini Expresso is strong with a slight bitter edge to it. 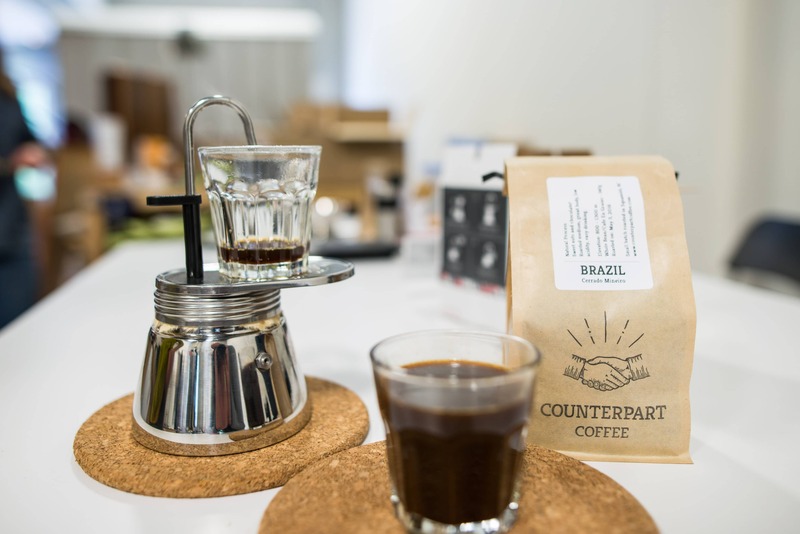 We used the Brazilian bean in our brew and it was good of course but a distinctively different flavour than some of the other coffee makers produced with the same bean. The first bit of coffee is bubbling up. As for the machine itself, it doesn’t come with a cup and not any cup will do. Ideally you’ll want to find one that’s shorter than the nozzle but not too narrow or it may overflow and make a mess. Also, you’ll want to have a second cup available. The machine will continue to produce small amounts of coffee for a short while after it’s removed from the heat and so this second cup can catch these last bitter drips while the first cup is being drank. Mid-brew. The small plastic handle can be seen on the back of the spout. 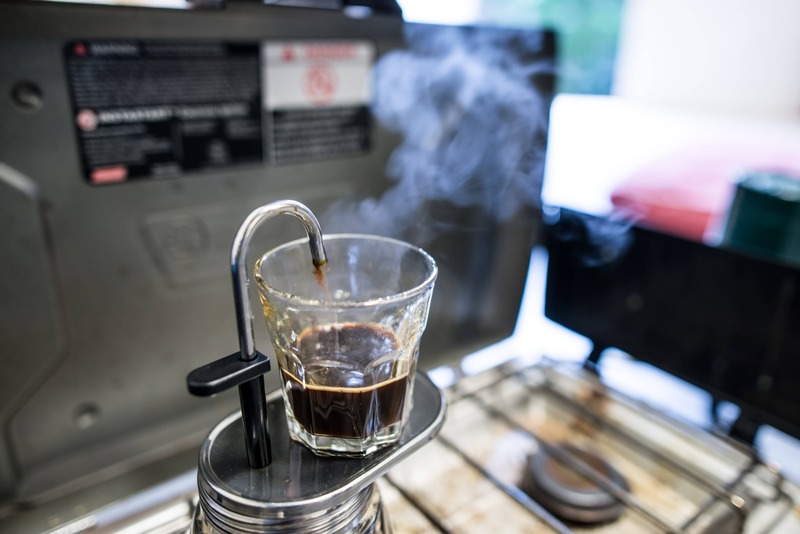 There’s a small plastic handle on the back of the spout that can be used to pick it up off the stove when it’s hot though some gloves or a rag are still useful when handling the unit after the coffee is brewed. Expert note: preheat the coffee maker as well as the water before putting it into the bottom chamber for better results (thanks Tim). The full cup of coffee that was produced in the foreground with the final dribbles in the extra glass on the unit in the background. Overall: This simple, compact and rugged unit produces a consistent cup of good coffee. Great for car camping where there’s a bunch of thirsty people to caffeinate. In case you’re wondering how we ground the coffee beans for this experiment (and many other cups of coffee before and since) I wanted to introduce the GSI Outdoors JavaMill. This compact grinder has a smooth action and produces a consistent grind. The perfect compliment to many of the coffee makers tested as fresh ground beans are so much better than old stale grounds. The GSI Outdoors JavaMill in action. Best Overall Coffee Maker: The Aeropress. This unit makes a really great cup of coffee even if it does have lots of parts and needs specialized filters. If you’re hitting the road and need that everyday brewer look no further. A little bulky for back packing though and it takes a bit more to clean-up than the Java Drip. Best Backcountry Coffee Maker: The GSI Outdoors Collapsible Java Drip. This is a great unit for backpacking or backcountry camping where size and weight are important or where water is scarce. It weights in at a measly 131g and is the size of a small pot lid. 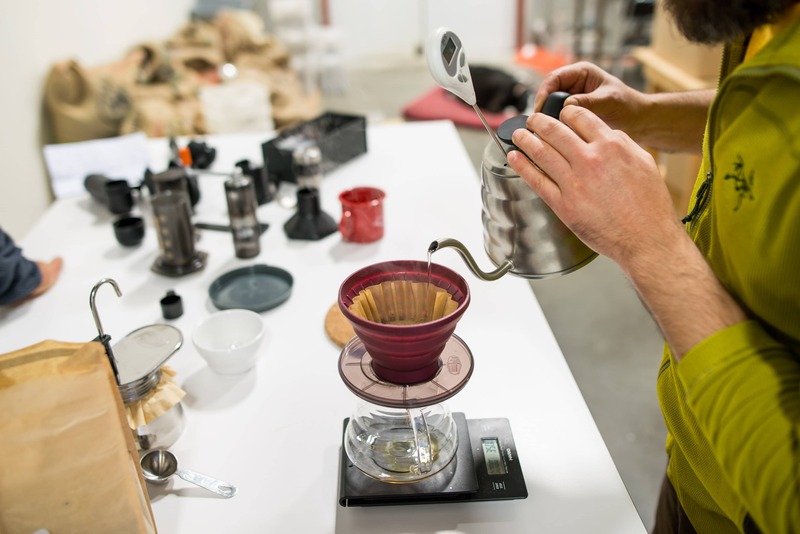 Clean-up after brewing is quick and easy as the filter with grounds is removed and the lid clips on and it brews a great cup of coffee. 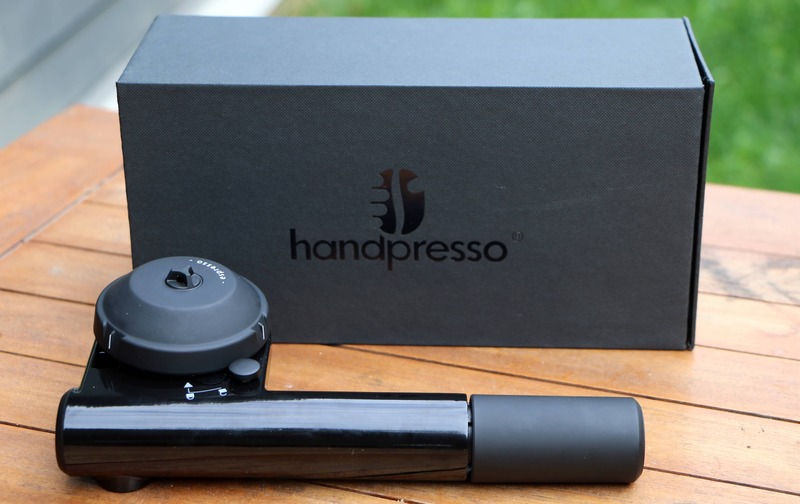 Best Espresso Machine: The Handpresso. For those people that want a shot of espresso and not a cup of coffee. This unit produced a pretty good shot the first time we used it and they just got better with practice. Because of its heavy weight it may not be ideal for backpacking however for car camping or a fly-in lodge this is the ticket. The Wacaco GR is a little lighter and more compact and so may be preferable for people that want to take espresso on a trip where weight and size are not critical but still a consideration. If you’re really looking to go fast-and-light you’ll want some instant coffee of course. Check out the Alpine Start instant coffee review where I compare the new Alpine Start instant to Starbucks Via. Some of these coffee makers were given to me for testing while I purchased others, however this did not influenced the review in any way. Most of the photos were taken by Raf (at least the good ones). Lastly, I wanted to thank Tim and Counterpart Coffee for helping us out,if you want some great coffee check out their website, they have a monthly subscription option where fresh roasted beans are shipped right to your door every month!